Ladies and gentlemen, my life is topsy-turvy crazy right now, but in a good way. Therefore, blogging has been temporarily truncated. I am in the middle of New Jersey currently, training for my brand new job and have had very limited free time. The free time I do have here, I have spent sleeping or watching the free cable in my hotel room! You probably know why. Until I return to the Chi in just a few short days, I thought I should share the only decorative addition I have made to my apartment, pretty much since the table other than some serious cleaning. That would be those guys above. 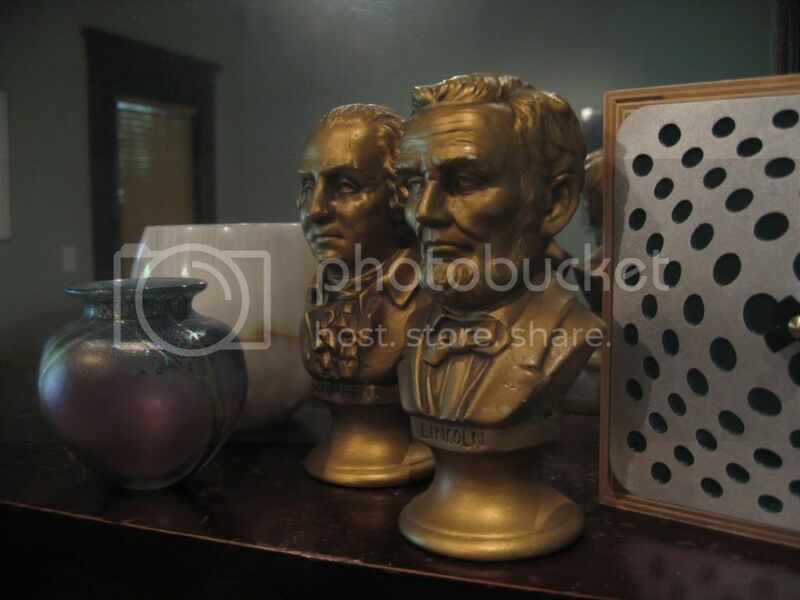 Yes, gold busts of Washington and Lincoln are now living on my mantel next to a tiny vase I received as a wedding attendant gift from a friend and that clock, which was a birthday gift from another friend, courtesy of the fabulous Superjumbodeluxe. I raved about the busts in a recent Outpost Outfitted post for Post 27 and broke down and bought them last week. I love them and think they look fabulous with the antique fireplace grate....not visible in photo due to the worst lighting ever in my living room. Check out the latest, and most apropos Outfitted post, which is ironically fitting given my travel this week. More to come soon! Do you have any favorite mantel piece?